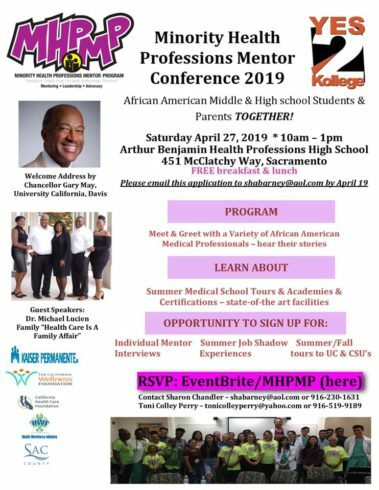 SACRAMENTO – Yes2Kollege is accepting registration for its Sixth Annual Minority Health Professions Mentor Program Conference to be held on Saturday, April 27. The event, aimed at youth who seek careers in the health field, will be held from 10:00 a.m. to 1:00 p.m. at Arthur Benjamin Health Professions High School, located at 451 McClatchy Way. There will be a morning address by UC Davis Chancellor Gary May. 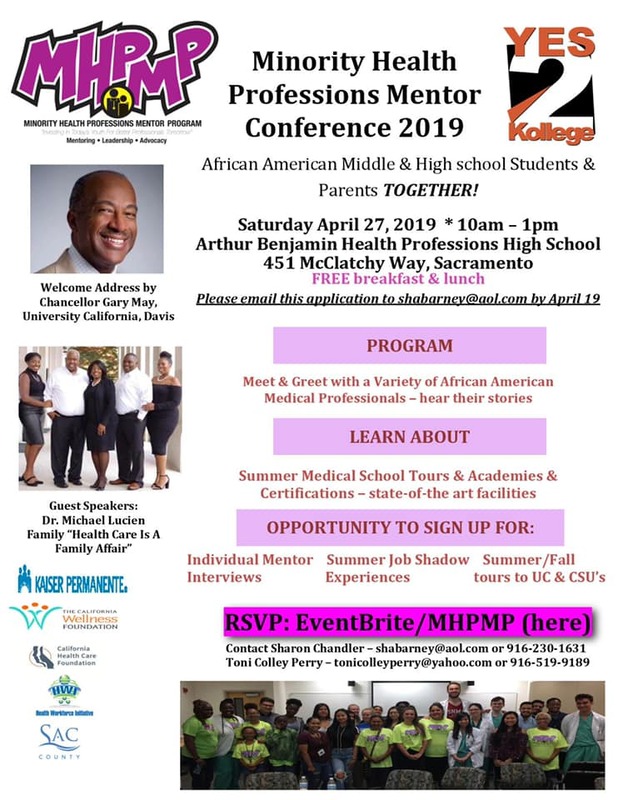 Attend and connect with African American health care professionals who will share their education career experiences. Learn more about the opportunity to shadow health professionals during the summer. The Minority Health Professions Mentor Program (MHPMP) Summer Job Shadow Experience targets African American Middle and high school students, but all are welcomed. During the conference participants will meet a selection of health care professionals and medical school students who will share their stories, and experiences in an effort to motivate and inspire you to begin early, choosing a medical field. After five years, the MHPMP Summer Job Shadow Experience has served more than 550 middle and high school students throughout Sacramento County.